I got the Wheezy build from here and followed their instructions on how to put it on the SD card in the paragraphs above the download section. Depending on what OS you are using, there are obviously different programs to use. Obviously, it can be set up any way but it must be connected correctly. 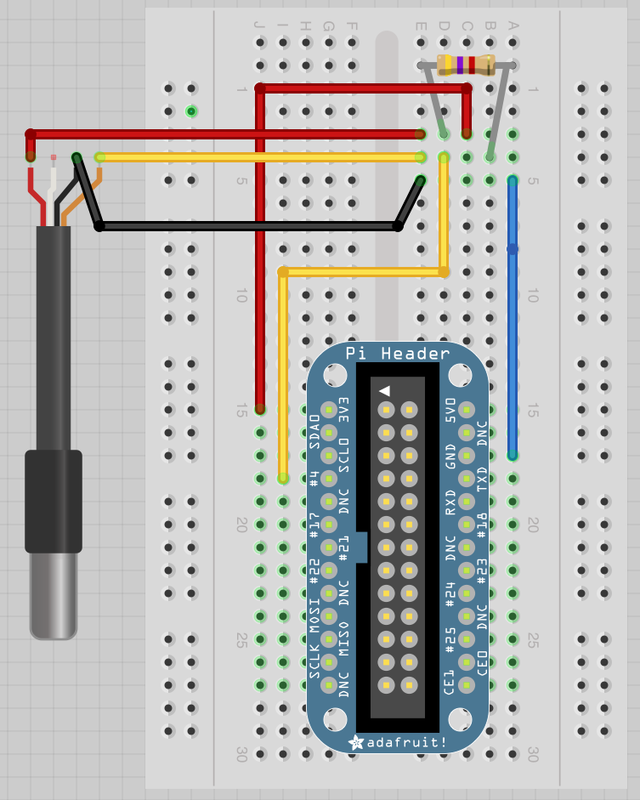 I'm talking about using different pins on the breadboard and placement and such. After that is done and the ribbon cable is connected, I powered the device on. You should feel the probe during this initial power-up. If it gets hot, which it will within seconds, turn it off and check your wiring. Running "cat w1_slave" inside that serial folder will produce two lines of output. the very last few digits will be the temperature in Celsius. Its at the thousands place so the python code further down that links page will tell us how to divide by 1k. and it should return a rounded-like (because of the int() statement) integer that is the Celsius degrees converted to Fahrenheit. The probe works and the temp is being converted. That step is done. Once we have all that done, we can install SMNPD and get it to respond to queries from a remote machine. This proved to be the most difficult for me because, up until this point, I always piggybacked on an existing SNMP install with the OIDs already there. Building this from scratch was definitely tricky for an SNMP nub like me. So, taking directions from a lot of places, Ill post links to the most helpful places here. Im not 100% sure if i needed the client portion, but I installed it anyway during troubleshooting steps. Please be aware that this is for a totally internal setup with no outward facing access therefore its pretty wide open. You'll want to check up on securing your SNMP install if you choose to have it facing the internet. and it will throw a ton of stuff at you from the console. you can also try that same command from a remote machine instead putting in the IP of the Pi rather than localhost and it should do the same thing. Please notice that I changed the directories where these files are located which you will need to do as well for this to work. If they are all in the same place calling the same files, you should be ok. SNMP likes them to be in that /usr/local/bin directory. i was NOT able to run them out of my home directory where i was originally building these files. i moved both the python scripts and the shell scripts to that location and everything is working fine. Again, please remember that I moved files around to that /usr/local/bin directory. That script calls the python script that actually does all the work; grabbing the output of the probe, parsing all the gibberish and converting it to Fahrenheit. snmp-get returns the results of the temp.py into a nicely formatted snmp query that can then be put into any program. I use nagios to poll a ton of other devices so this was an easy setup inside nagios once the output was generated and the ability to query against it was done. Exactly what I was looking for. 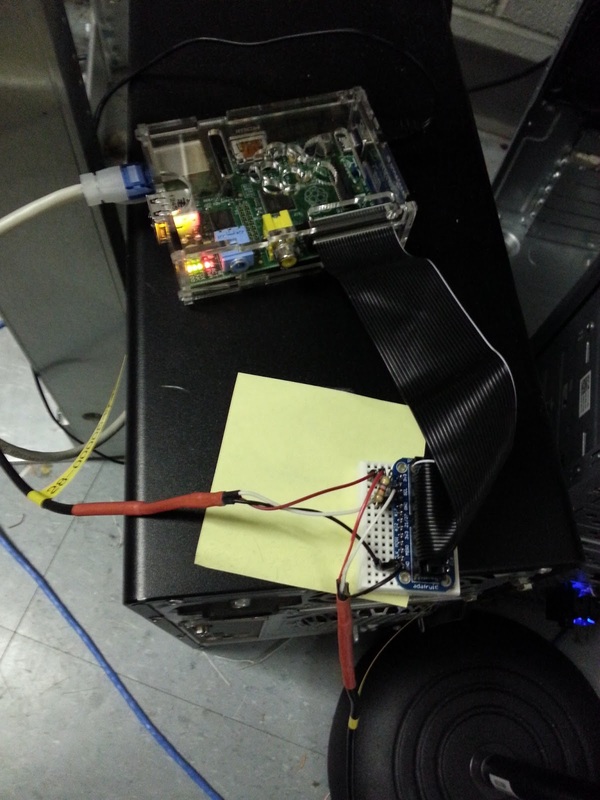 I have an extra raspi and it seems a simple SNMP temperature probe is $100 minimum. Why do that when I can build one for a lot less! My thoughts when I started doing this. We have other temperature devices around our buildings and they cost in upwards of $400 without probes. Alright chap, I've followed your above tutorial but I'm having an issue. it seems to break the SNMP output. So when you do a 'snmpwalk -v 1 -c public localhost' after restarting the snmpd it gets down as far as our OID and then outputs. Have you had any trouble like this? Or any idea what's up? Remove the "-g" in the line "pass [...] /usr/local/bin/snmp-temp -g". Simply put, the script should only output data when smptd calls it with the parameter "-g" (for details, see the man page for snmpd.conf). With the "pass" configuration line in the article, it will _always_ output data, which causes the problem you are experiencing. I know i had an issue with those lines. that is why I put the "-g" in there. Ill have to re-read through my notes as to why that was in there originally. You are saying it is safe to take it out? without Remove the "-g" in the line "pass [...] /usr/local/bin/snmp-temp -g". I want to read GPIO-pins via snmp. So I looked through your scripts and adapted them. If I run the shell-script on the Pi everything looks good. I get three lines with the OID, the type (gauge) and an integer (17 for closed and 99 for open) depending on the GPIO that was pulled to ground. Only when I read the OID via snmp (locally or over the network) I get the OID, the type, but 0 as the value. Do you have any ideas what I am missing? I can get the temp of the PI ok via snmp. I have done everything similar to what you mentioned but get a zero when I use snmp to get the status of a gpio pin. Did you add a new address .1.3.6.1.2.1.25.1.9.0 in the SNMP config? What am I missinge here.....? When I execute the "snmpget -v1 -c public localhost .1.3.6.1.2.1.25.1.8.0"
Any idea where the .3 get lost? So what to do if you get 0 ?